Now the war's over and you and your crew of freelance effectuators patrol the edge of civilized space, trying to pay the bills while you keep the peace. 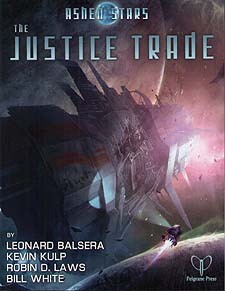 The Justice Trade contains three adventures for Ashen Stars - The Justice Trade, Terra Nova and Tartarus. Written by Leonard Balsera, author of Profane Miracles and co-author of the smash hit Dresden Files; GUMSHOE designer and gaming luminary Robin D. Laws, and Bill White, author of The Big Hoodoo. It also includes a bonus twenty-minute demo game by Kevin Kulp. The Justice Trade When the PCs answer a distress call from the planet Cabochon, they become embroiled in the political machinations of two powerful figures who each seek to shape the future of the Bleed. Will they choose to do good and make the Bleed a better place - or to do well for themselves? Tartarus - In a devastatingly hostile environment, hard-bitten lasers - who know enough not to touch the gooey stuff or take off their helemts in an untested biosphere - investigate the demise of a survey crew doomed by the above mistakes. Terra Nova The Terra Nova, last of the great luxury liners from the Combine's heyday, is dead, a victim of disaster now drifting in the space between worlds. The last of the survivors clutch desperately to life, waiting for rescue. All but one; who waits for a chance to finish the job, uncovering a secret, which the Terra Nova has kept hidden for decades. Stowaway - A twenty-minute demo, which is a great introduction to ashen Stars and includes six pre-generated characters.